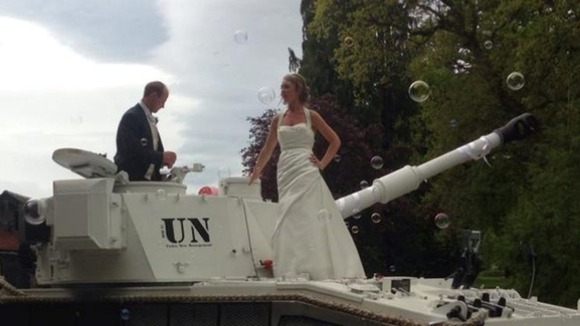 When Adelle & I planned our wedding yes there had to be a tank involved however not a standard camouflage one but a nice white one that blew bubbles as well as made a bang! Unknown to us the wedding photographer sent the pictures to the local paper but when the Scottish Sun & Star News paper published the article,we were surprised when it made the papers! Not only did it make the news paper we were shocked to find out it made the Stv News website! 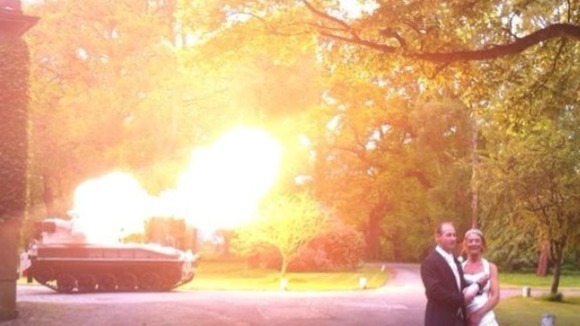 It may not have been a traditional entrance but bride Adelle Spasic arrived at her wedding on a tank. The couple, who wed in Perthshire in Scotland, chose the unusual mode of transport after groom Rod Sim proposed on one. Painted white especially for the occasion, the tank, which was used in the first Gulf War, came fully fitted with a 16.5 tonne self-propelled gun which fired and blew out bubbles as they greeted their guests.